Chitrakoot district in Uttar Pradesh is a spiritual retreat, thronged almost throughout the year by travellers, who have a penchant for the unknown and unexplored. Famed in Hindu mythology, Chitrakoot is celebrated in ballads and scriptures for its religious importance and close association with the epic Ramayan. Chitrakoot meaning “the hill of many wonders” falls in the northern Vindhya range of mountains spread over the states of Uttar Pradesh and Madhya Pradesh. It is believed that Lord Rama spent a major part of his exile here. According to the epic Ramayana, Chitrakoot is the place where Bharat, brother of Lord Rama came to visit him and asked him to return to Ayodhya and rule the kingdom. It is believed that the supreme Gods of Hinduism, (Brahma, Vishnu, and Shiva) took incarnations here. The place is dotted with many temples and several religious sites. The magnificent Bharat Milap Temple is a place where Bharat (one of the younger brothers of Lord Rama) came to meet Lord Ram and offered him the kingdom of Ayodhya. According to mythological stories, the meeting between the two brothers was so overwhelming that even the stones melted. Their footprints can still be seen engraved in the stones. In the months of October and November, a fair is organized every year. The fair is known by the name ‘Bharat Milap Mela’, which is celebrated with great pomp and enthusiasm. Thousands of devotees and visitors come here to participate in the fair and see the vivid cultural heritage of the sacred city. It is a long stretch of steps made on the bank of Payaswani River. People believe that the sacred Sarayu River surface from its underground source here and then again vanishes. It is the most beautiful bathing ghat of the Payaswini River believed to be capable of absolving a person from all his sins. It is believed that Lord Ram bathed here with Laxman and Sita on their arrival in Chitrakoot. This place is also associated with the famous saint-poet Tulsidas who is believed to have blessed with darshan of Lord Ram and Laxman. According to legends, Tulsidas was preparing sandal-paste for himself, when Ram and Laxman appeared before him as two children. Ram asked him to mark a tilak on his forehead. Tulsidas did this even without recognizing him as God whom he so devotedly worshipped and for whose darshan he was craving for. It was Hanuman who helped Tulsidas to recognize the Lord. There is a huge statue of Lord Hanuman in the middle of Ram Ghat. The Hanuman Chalisa written by Tulsidas is written on the stone on which this huge statue is placed. Just south of this main bathing area of Ramghat is the Raghav-Prayag ghat on the Payaswini River. The Mandakini here is also often referred to as the Payaswini, but there is a distinction. At the Raghav-Prayag ghat, there is a confluence of the Mandakini, Payaswini, and Gayatra (or Savitri) Rivers ( Triveni Sangam) , but it is not visible to the eye. It is believed that here Lord Ram performed “pitra tarpan”, making offerings to his father, King Dashrath, who expired after Lord Ram went into exile. Literally translated, Sphatik Shila is Sanskrit for ‘crystal rock’. It is essentially a flat boulder, where Lord Rama was believed to have once rested upon, with his wife Sita, and admired the scenic beauty of Chitrakoot. The boulder gets its name from the fact that it has a glass like or crystalline finish, which still contains the footprints of the lord, his knee print, Sita’s footprints and Lakshman’s foot prints. To see the footprints one has to make a climb up the boulder. According to the legends, a crow attacked Sita when a fatigued Rama was sleeping on her lap. The crow pecks at her twice on her feet. Rama is awakened by the stirrings and recognizes the crow whose claws were dripping in blood as the son of Indra. An enraged Rama, at the behest of Sita, unleashes the divine weapon Brahmastra on the crow, which flees in fear. Turned back by Indra, the gods and rishis, the crow takes refuge in Rama and surrenders to him. He requests pardon, but Rama says that the Brahmastra cannot be withdrawn. So, the son of Indra asks it to hit the crow’s right eye, and he is left half-blind. It is also believed that while Sita was injured, Lord Rama took care of her, which is why Sphatik Shila also represents the love between Lord Rama and Sita. This makes it a prime destination for all the pilgrims visiting Chitrakoot. It is a cavern located at a distance of 18 km south of Ram Ghat. Gupt Godavari Caves seem to be the best attraction of Chitrakoot. 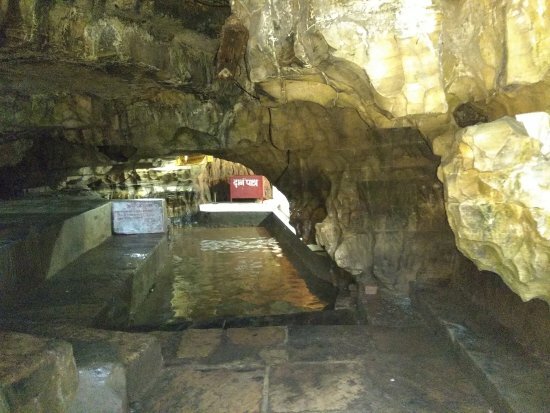 As per the legend, the Godavari River emerging as a perennial stream from the rocks deep inside this cave, flows down to another cave below and then disappears in the mountain. A massive rock is seen protruding out of the ceiling which is believed to be the remains of the Demon Mayank (Mayanka).This demon had the audacity of stealing Sita Maa’s clothes when she was bathing and hence was killed by Lakshman. It is believed that during their exile, Lord Ram along with his brother Lakshman held a court in this cave. Tourists can find a beautifully carved sculpture of Trinities Brahma, Vishnu and Shiva at the entrance of the cave. It is a place which was created by Lord Rama to ease the pain and burning of Shri Hanuman, on his way back from Lanka after he set it on fire. It is believed that Lord Shri Ram pierced an arrow from his bow which penetrated in the mountain and raise a fountain of dhara ie., water which ultimately relieved and soothed Shri Hanuman. This place from then on is referred to as Hanuman Dhara. This is a most awe-inspiring and tranquil site which lies in Chitrakoot. One can be very relaxed and stree-free by mere having a look at beautiful and picturesque waterfall in the area and can forget all pain and furies of life. Such is the divine bliss of this place. Temple is majorly dedicated to Lord Hanuman, and holds rarest of rare idol of deity. The spring water falls over the idol and drenches it and ultimately all neighbouring area encircled by kund. The Sita Rasoi is situated about 100 feet from the Hanuman Dhara. Her kitchen tirtha is also known as Pramadgni Asrama. Shaded by several trees, the place where Sita is said to have cooked kandmools (root vegetables) during their stay here. It is one unique temple where puja (worship) and offerings are prohibited. This temple helps people enter integral Humanism by imparting them the valuable moral lessons. The temple is an amalgamation of cultural and human aspects and leaves a mark on anyone’s heart who ever visits this temple. The temple gives an insight to Lord Rama’s life and his inter- personal relations. One needs an entry ticket to enter the premises. It is believed to be the bathing place of Sita Mata during the period of their exile. There are foot prints of Sita Mata on the rocks in the nearby boulder. The water in Janaki Kund is crystal clear wherein one can see the small stones turning and rotating moving under waters of Mandakini. The water is apparently transparent as the nature is immaculate and most excellent here. All most all pilgrims, especially ladies, strongly believe that this holy water has been sanctified by Sita Mata and a dip in this spot would wash of all their sins and purify their souls. At Janki Kund one can also see Ram Janaki Raghuvir mandir and Sankat mochan mandir.